As part of my daily surgical dexterity practice, I play the piano. But I also need feedback by self-assessing my technique by making videos. Most importantly the sound created with my fingers, arms, and body is important. I do load the videos up onto the internet at times to get feedback from others. I would say that there are plenty of experts out there on the internet who know a lot more about piano playing than I do. 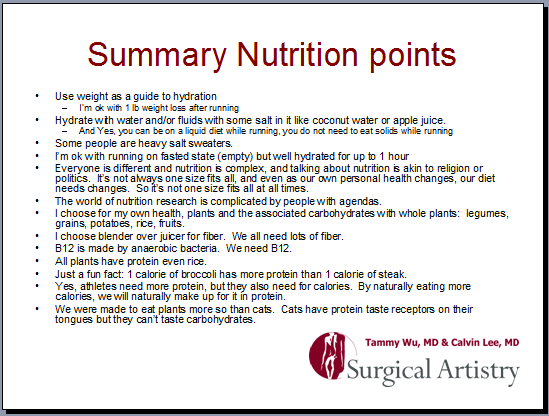 But part of my goals is to have my dexterity improve for my cosmetic surgical practice where I inject Botox, Fillers, Veins and I perform Acupuncture too. Two social sharing platforms are FaceBook and YouTube. I had to compare to see which one had better sound quality. In the end I think the sound quality goes with the video quality. YouTube won out in my opinion. But both platforms do change the volume and degrade the quality of the original file which was taken as a quicktime move with a Canon 60D camera which I got from Costco about a year ago. I did the listening through a new beyerdynamic professional headphone. It’s the Beyerdynamic DT 770 Pro 80 Ohms. 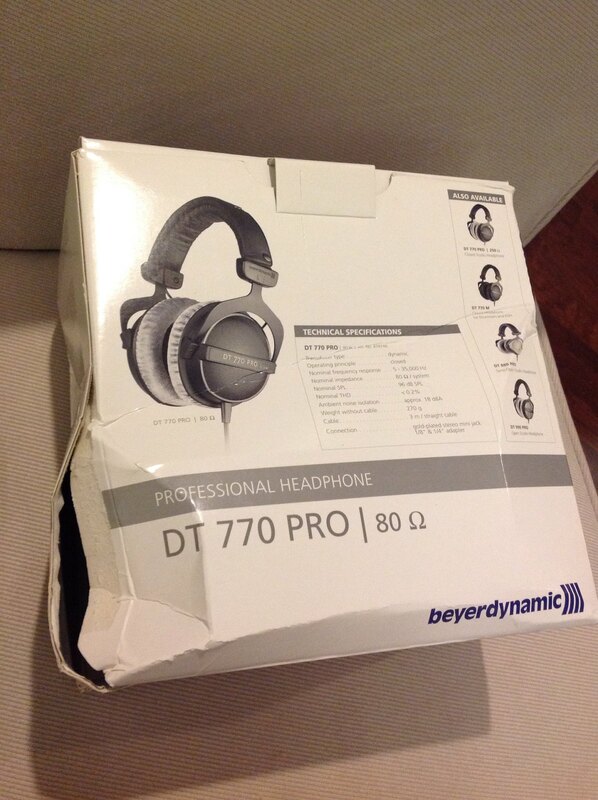 The box got crushed in the delivery to me, but I think the headphones are fine. This is how it arrived (there was an outside box that got beat up too). The box was torn in several places, but I think miraculously the headphones were flexible enough to take some of the squishing that happened. This entry was posted in Education, FaceBook, General Info, General Surgery, Modesto, Music, Piano, Plastic Surgery and tagged beyerdynamic, sound quality on May 24, 2014 by Calvin Lee, MD. Peptides, another hot topic in skin care, signal cells to stimulate collagen and elastin. Peptides are short strings of amino acids which can act as signaling molecules to help slow down visible signs of aging. 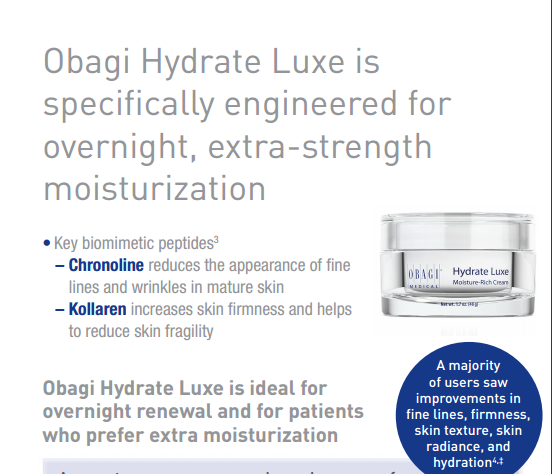 Obagi Hydrate Luxe is the first and currently the only product at Surgical Artistry which contains peptide technology. Obagi Hydrate Luxe containes two key peptides which reduce the appearance of fine lines and increases skin firmness: Chronoline and Kollaren. This was my attempt to teach and discuss within our Modesto office. Vitamin C is used by fibroblasts to make collagen and elastin. Vitamin C is also an antioxidant which has a photoprotective effect by reducing damage to cells and DNA which are caused by oxidation from UV light exposure. Oxidation is also caused by pollutants over time. The vitamin C also protects the sunscreen from oxidative changes caused by UV light. This allows the sunscreen to work with less degradation from ultraviolet light. Skin care is an integral part of plastic surgery. When to restart Tretinoin after Obagi Blue Peel Radiance? Thank you! Enjoy! Disclaimer: double check the facts, I’m just writing all this off the top of my head. Facts can change over time too. This entry was posted in dermatology, Education, General Info, Modesto, Obagi Blue Peel Radiance, Skin Care, Teachers on May 22, 2014 by Calvin Lee, MD.